The scleroderma therapeutics and diagnostics market exhibits high potential due to untapped needs and is set to grow rapidly in the near future due to the increasing focus globally on treatment of orphan diseases. The lack of approved drugs in the market makes it a highly opportune condition for players to convert their innovative drug ideas into successful treatment methods for this rare chronic inflammatory disease. 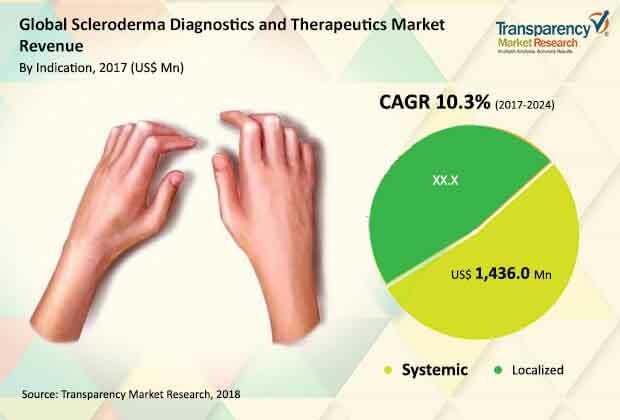 According to Transparency Market Research, the global scleroderma diagnostics and therapeutics market was valued at US$1,689.7 mn in 2017 and is projected to expand at a CAGR of 10.3% from 2017 to 2024 to reach US$3,663.8 mn by 2024. Presently, there is no approved drug for treatment of this orphan disease. Although drugs to manage symptomatic relief are available in the scleroderma therapeutics market, the treatment of scleroderma is challenging for a physician, since no two patients are alike in the progress of their disease. Thus, a host of different drugs are prescribed to every patient, depending on the extent, severity and nature of their symptoms. It has been observed that patient consumption patterns in the global scleroderma diagnostics and therapeutics market are inclined towards immunosuppressive agents, which have shown to provide relief against several symptoms in both systemic and localized scleroderma cases. Moreover, of the very few treatments identified to efficaciously modify the course of scleroderma, physicians often recommend immunosuppressive agents to manage the most common symptoms of the disease. The segment, as a result, accounts for the dominant share in the global market. Prostacyclin analogues have been found to have a potent effect in treating systemic scleroderma patients who suffer from pulmonary arterial hypertension. However, these drugs are expensive and thus, even though a smaller sub-set of patients is administered with these agents, their market value is high. This segment grabbed a significant share of the global scleroderma therapeutics market in the recent past; however, the share of this segment is anticipated to slightly decline by 2024 owing to availability of cheaper alternatives within this segment. Owing to better diagnostic and treatment rates, in part due to proactive awareness-raising initiatives by various foundations, have aided North America and Europe gain the predominant share in the global scleroderma diagnostics and therapeutics market. North America and Europe held significant share of the global scleroderma therapeutics market in the recent past. This is attributed to presence of renowned pharmaceutical companies, research organizations, and institutes in the regions, which are focused on finding a standard treatment for the condition. The North America and Europe markets for scleroderma diagnostics and therapeutics are expected to retain their dominance in the global scleroderma diagnostics and therapeutics market throughout the forecast period, exhibiting significant CAGR over the period between 2017 and 2024. The ongoing cutting-edge research pertaining to scleroderma will aid the growth of a niche scleroderma diagnostics and therapeutics market in these regions. Asia Pacific represents some of the world’s key emerging economies, which have the potential to adopt quickly to new therapies, provided they are available at reasonable costs. Due to the price-sensitive nature of the market, as well as availability of cheaper generics and reasonable clinical diagnostic rates compared to North America and Europe, the market for Asia Pacific gained the third position in terms of market share in 2015. The Asia Pacific market will also retain its position in the global market over the forecast period, with factors such as large population and high unmet needs working in favor of market expansion in the region. Actelion Pharmaceuticals, Inc., Boehringer Ingelheim, Bayer AG, Cytori Therapeutics, Inc., Corbus Pharmaceutical Holdings Inc, Cumberland Pharmaceuticals, Inc., Gilead Sciences, Inc., Pfizer, Inc., and Sanofi are some of the key players operating in the global scleroderma diagnostics and therapeutics market. Stakeholders of this report include companies and intermediaries engaged in the manufacture and commercialization of various scleroderma drugs as well as new entrants planning to enter this market. Included in the study is a detailed discussion on vital market indicators, which include demand drivers, challenges, and opportunities. The impact of these indicators on the scleroderma diagnostics and therapeutics market over the aforementioned forecast period have been ascertained as well. Furthermore, the report also examines growth trends and technological advancements that are likely to have a bearing on the growth of scleroderma diagnostics and therapeutics market between 2017 and 2024. Following this, the report discusses value chain analysis to throw light on demand supply dynamics in the scleroderma diagnostics and therapeutics market. Industry-centric analytical tools such as SWOT analysis and Porter’s five forces have been employed for insights into the competitive landscape of the scleroderma diagnostics and therapeutics market. In addition, the report presents market attractiveness analysis wherein key segments within drug class, indication, test type, and geography have been identified and analyzed for their growth behavior. The report has been prepared after an elaborate primary and secondary research phase. Thus, the analysis of the scleroderma diagnostics and therapeutics market presented in reliable to a high degree. The primary research phase involved carrying out telephonic as well face-to-face interviews with industry experts along with e-mail interactions. Primary research represent major part of research efforts along with a secondary research phase. Industry stakeholders who participated in the primary research phase include CEOs, VPs, market intelligence managers, marketing/product managers, and national sales managers. Purchasing managers, technical experts, suppliers and traders were some other stakeholders who were reached out in the primary research phase. Rheumatologists, dermatologists, and physicians treating scleroderma patients were also reached out in the primary research phase of the making of the report. Secondary research phase involved reaching out to industry-centric databases for data collection followed by data scrutiny. Secondary sources reached out include key players’ product literature, annual reports, relevant business documents, and trade journals. Some other secondary sources reached out include trade journals, technical writings, government websites, trade associations, Internet sources, and online paid databases. Secondary research sources reached out for the study include stock analyst websites, company website sources, governmental organizations and public portals, Orange Book – FDA, U.S. Centers for Disease Control and Prevention, European Centre for Disease Prevention and Control, Clinicaltrials.gov, Clinicaltrialsregister.eu, journals and other publications.